A fun treat to make during the holiday season. 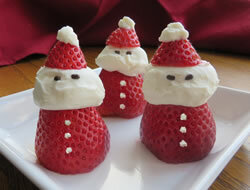 These little Santas are sure to catch everyone's eye amongst all those holiday sweets. Grab yours early. They will disappear fast.